I’m very pleased to announce that Catherine Mair, founder of the Katikati Haiku Pathway, has published her first volume of collected works – haiku, tanka and haibun – with the title incoming tide. Catherine, who was awarded a Queen’s Service Medal in 2008 for her services to poetry and the community, was also the founding editor of winterSPIN when it began publishing the Japanese forms/ short poetry, a publication that evolved into Kokako, New Zealand’s only journal dedicated to haiku, tanka, etc. 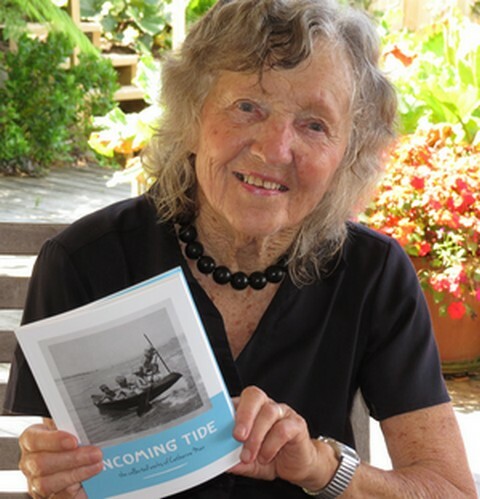 incoming tide is 75 pages and sells for $25 (including P&P within New Zealand) – send ordering information and cheques to Catherine at PO Box 62, Katikati 3166. People outside New Zealand who wish to purchase a copy should email Catherine to inquire about rates. The book, which shows Catherine and her siblings as children on the front cover, has been handsomely produced by Kale Print in Tauranga. ISBN 978-0-473-35061-1. Disclaimer: I have been involved with the production of this book so don’t feel able to review it. My general view that it’s a worthwhile collection from someone who has been writing haiku for almost 40 years. The quarterly issues of A Hundred Gourds and The Heron’s Nest are out, with the news that AHG is to cease publication after its June issue which will mark 5 years. Sad news as from its inception A Hundred Gourds has been a benchmark publication, not an easy thing to achieve. But editors have lives too and running a large publication, whether online or in print, demands a time commitment that not everyone is willing to give. In other words, they’ve earned a lie down and a cuppa! Managing editor Lorin Ford assures readers and contributors that the AHG archives will remain available once publication ends, which is excellent. 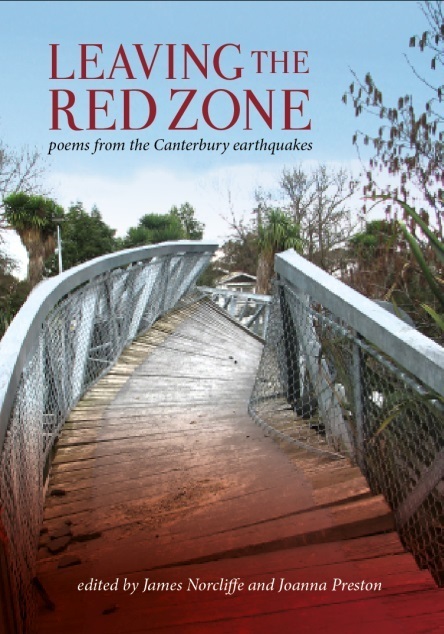 Leaving the Red Zone is an anthology of poetry written after and about the Canterbury earthquakes of 2010 and 2011 and was launched on February 29, a week after the fifth anniversary of the deadly quake that shattered lives and the city of Christchurch. The cover image is of one of the footbridges across the Avon river, buckled by the second quake. Edited by James Norcliffe and Joanna Preston, the book has been published by Clerestory Press. The book is large format (172mm x 245 mm) softcover, 180 pages, with the work of 87 contributors from across New Zealand, with a few offshore as well. You can read some snippets of poems on Helen Lowe’s blog. Or you can hear the editors talking to Radio NZ’s Wallace Chapman (14:52). I was so pleased the editors accepted this one, which was first published in a fine line, the magazine of the NZ Poetry Society in March 2012. The late John O’Connor reckoned it was one of the best poems about the earthquakes that he’d read! In the broadcast linked to above Joanna says that she and James were searching for ‘poetic truth’ and that some quite good poets with poems that were ‘perfectly okay’ had been left out because there was no ‘little electrical spark to make you sit up’. To purchase a copy, go here to find an order form, bank transfer details and the publisher’s contact details. The book costs $39.95 with free delivery within New Zealand. All profits go to the Mayor’s Earthquake Relief Fund.